It was a fantastic stay, just seating place around a table and internet wat not ok. As it was a holiday i did not care. It was super relax! Thank you for your review and we are delighted that you found the house "super good" and that it was great for your stay. I am sorry about the internet, but if you had contacted us, we would have certainly investigated it for you. We pay a large monthly subscription to have the best possible internet for the location and so we always follow up if our guests experience any problems with the provider. We will certainly ensure any issues are totally resolved for the future. Thank you again for your great review. Nous avons passé un excellent Noël dans cette belle maison. Pièces spacieuses, rien ne manque. Les extérieurs donnent également envie de revenir en été ! Merci...thank you for your perfect review and we look forward to you coming back in the summer. We had a lovely week at Les Vignes. The house is everything you would imagine from a big, old, characterful, French house. The amount of space was brilliant for us with two teenage boys, but in the evenings we all gathered together in the lounge to enjoy a blazing log fire and have some great family time watching films together. The house was very well equipped and we were able to cook and prepare meals just as we would at home. The washing machine etc all worked perfectly which was important for us as we travelled light and did do a couple of washes. Our boys enjoyed the luxury of having a large bedroom and en suite each, as did we. There was a further massive room on the third floor that we didn’t use. The garden was lovely with good bbq facilities, fresh herbs for cooking and badminton and boules for the kids. Jugon-les-Lacs was definitely the best, nearest village to go to each day for bread (5 mins drive) and had 3 to 4 places to eat and a supermarket open for long hours each day and also Sunday mornings. We also made use of the swimming pool at Jugon-les-Lacs which is part of a campsite but open to the public for a relatively small fee. Mégrit which is the other nearest village is worth visiting, but now only has a small tea shop rather than a bakers, so best to go for afternoon tea or a delicious homemade ice cream later in the day. Dinan and Dinard are an easy drive away and the beaches at St Briac Sur Mer and St Lunair are a must if the weather is good. Overall we had a wonderful, peaceful and relaxing week in a big, old and characterful French house which we would highly recommend. Thank you so much for your wonderful review. Your description is absolutely spot-on and the reason that we have been enjoying the house so much for the past twenty years. It was a pleasure to have you stay! Les Vignes was the perfect setting for our family holiday. The house is very comfortable, provides plenty of room and is full of character, with everything we needed - indoors and outdoor and just as described. The badminton was a lovely surprise! 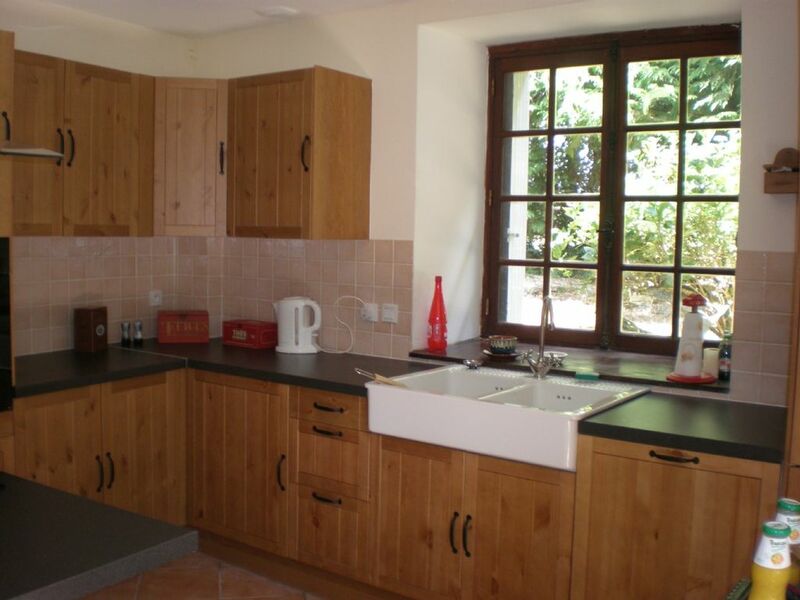 The location is great, with the beautiful Jugon -les-Lacs just 10 minutes away. We also visited Dinan, Le Mont St Michel and enjoyed a lovely walk along the coastal path at Cap d'Erquy, with stunning views and quiet beaches. Stuart and Julia couldn't have been more attentive and helped and advised us both before and during the holiday. Their local managers were extremely helpful and although there was a problem with the internet they did all they could to fix it as soon as possible. Thanks also for the advice about the hidden jewel of the castle at Hunaudaye and the great restaurant nearby at l'Hermine Blanche. Our only regret was that we couldn't stay longer! Thank you so much for your wonderful review. It was a real pleasure to have you stay at the property and so pleased that you enjoyed it as much as us. Thank you for your patience with the internet - we have now replaced it with a new router and Orange box and all is good. I really enjoyed a week in this lovely house with my friends. It has been renovated to a high standard with all mod cons. There is plenty of room for all with 4 bathrooms and plenty of hot water for all. The weather was fantastic so we really enjoyed the huge gardens and played many games of badminton and croquet. We also went boating on Jugon Les Lacs which is just 5 minutes away by car and went to many of the stunning beaches about 30 minutes away. I really had a great holiday in rural Brittany. Thank you so much. Thank you so much for your positive review. We are delighted that you enjoyed your time, especially the graden, so much and look forward to welcoming you back in the future. Thank you very much for your review. We are delighted that you enjoyed your stay so much. Includes all water and electric charges and normal cleaning. A deposit of 100 pounds will be required with the booking and the balance and a refundable security deposit of 200 pounds will be required eight weeks before the holiday. Linen and towels can be provided at an extra cost of 12 euros per person but please make it clear that you need this service upon booking.